We don’t need much for the following samples .. Java of course, Maven dependency management and that’s all ..
We don’t have much to do here .. we need a mavenized project and one dependency ..
Before we’re starting to write our tests we need some classes to be tested and mocked.. they’re all created in src/main/java in the package com.hascode.tutorial. Mockito is not able to mock static or final classes – I’ll show you how to do this by combining Mockito and PowerMock in the last chapter. For all other stuff we’re able to create mocks using Mockito.mock or – my favourite – annotations and mock injection. Since version 1.8 a mock can be resetted using reset(mock) – or in our example reset(userRepository);. More details on this in the section about verification..
Another nice feature (since 1.8) is the @InjectMocks annotation that allows setter injection for mocked dependencies but be aware you need to call MockitoAnnotations.initMocks() to make it work. Now that we’re able to create mocks the next step is to stub some method calls ..
and many others .. for a complete list of available matchers and providing custom extensions to the matcher API take a look at the Matcher javadocs. Please be aware that if you’re using argument matchers, all arguments in verify or stub must be provided by matchers. 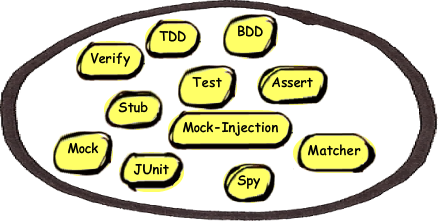 Mockito’s test spy features allow the developer to take a look behind the curtain and verify how often, in which order and how long invocations on a mock object’s method have been triggered. Verification enables you to test the behaviour of methods with void return but you shouldn’t overuse this feature .. use JUnit’s Assert methods when possible, verify when needed.. more about this topic from the creator of Mockito: Szepan Faber: Is there a difference between asking and telling? If you’re going to take a deeper look into BDD please take a look at the following article of mine about BDD and the JBehave framework. Often a developer gets into the situation to mock final or static classes from third-party libraries or legacy code. Mockito alone is not able to mock static or final classes .. we could – of course write utility classes using the reflection API or – just take a look at the PowerMock framework. With Mockito 2 it’s possible to mock static or final classes without using external tools like PowerMock. Now mocking final or static classes should not be a problem. Szepan Faber: Is there a difference between asking and telling? Martin Fowler. Should I be a classicist or a mockist? 2017-10-03: Examples for mocking static or final classes with Mockito 2 added. This entry was posted on Sunday, March 27th, 2011 at 11:26 am	and is filed under Java. You can follow any responses to this entry through the RSS 2.0 feed. You can skip to the end and leave a response. Pinging is currently not allowed. regarding matchers, I think what you say is slightly misleading, e.g. any(java.lang.Class clazz) any kind object, not necessary of the given class. The class argument is provided only to avoid casting.